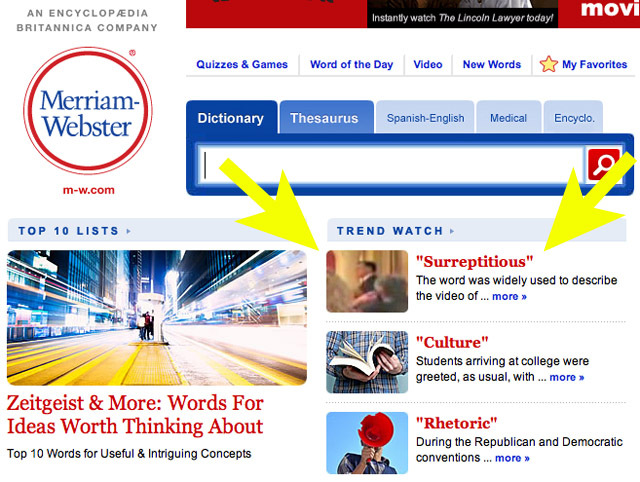 Under “surreptitious” in the dictionary, see us. In the main campaign story of the week, surreptitious was widely used to describe the video of Mitt Romney speaking to wealthy supporters at a fundraising dinner and discussing low-income voters. The video was apparently taken without the knowledge of the candidate or others at the event. Okay, I’ll stop without further comment, before they update their page and list us under “bluster” and “hubris.” Meanwhile, true fans of verbiage can continue to puzzle over which “vulgar, unprintable phrase” an anonymous adviser used to describe the Romney campaign to the New York Times!